Abu Bekr Temple was organized in March, 1907, with a nucleus of 30 Nobles living in Sioux City. Since that day 87 years ago, has grown to a membership of more than 2,600 in a wide area encompassing much of Western Iowa, 2 counties in NW Nebraska, and 2 in SE South Dakota. The first ceremonial was held on October 17, 1907, when the first class of novices crossed the burning sands. 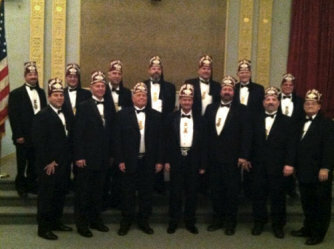 With the first initiates and other Shriners who had settled in Sioux City, the charter membership of Abu Bekr Temple reached 400. Almost immediately a Foot Patrol was organized under Capt. Charles A. Borman to represent the Temple at the Imperial Session in St. Paul in 1908. Today there are 24 organized uniform units of Abu Bekr Temple and eight Shrine Clubs. Abu Bekr originally included only Sioux City Shriners, but by action of the Imperial Council in June, 1922, the jurisdiction was enlarged to include 22 counties in Western Iowa. They are: Lyon, Osceola, Dickinson, Emmet, Sioux, O’Brien, Clay, Palo, Alto, Kossutb, Plymouth, Cherokee, Buena Vista, Pocahontas, Humboldt, Woodbury, Ida, Sac, Monona, Crawford, Harrison, Shelby and Pottawattamie.